After 25 years in late night, Conan O’Brien wants to make sure he never has to run out the clock on his career. With a multi-city live tour, a new podcast in the works, another installment of his internationally famed Conan Without Borders specials in the can, and the announcement that his TBS show Conan is moving to a 30-minute format, it’s clear that the veteran host is ready to break free from talk show convention. O’Brien sat down with CNN’s Jake Tapper for a Q&A on Thursday as part of the New York Comedy Festival to discuss the changes to Conan and how he’s approaching this latest iteration of his show, which he sees as a much more interactive, digital-friendly production. 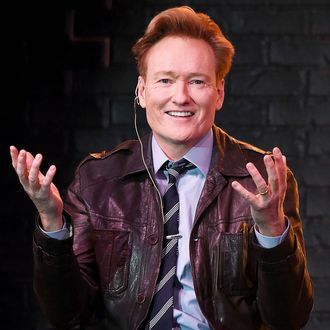 O’Brien is in town for a live show at the Beacon Theater, part of his Conan & Friends tour, his first time touring since The Prohibited from Being Funny on Television Tour that followed his run on NBC’s Tonight Show in 2010 (“It’s a very different tour. That was a juggernaut … This is more like the acoustic, stripped-down version,” he said). For the last week, he’s been living out of a suitcase, performing in a different city every night with comics who have been on Conan, and directly connecting with fans via audience Q&As — something he says will affect how he approaches his “leaner” TBS show in 2019: “I prefer smaller cookie, more chocolate chips,” he joked. Going from a 44-minute show to a 22-minute one will be an adjustment. The shorter version will not feature his old house band (he’s looking for “something much more informal”), and he plans on bringing the audience much closer in. The digital components are key — his team won an Interactive Emmy this year — and he knows that conventional late-night segments were essentially “time killers” created in the ’50s and aren’t the clips people today are searching for the next day online. Still, we can expect the same O’Brien we’ve come to know and love in the slimmer episode format. “It’s still me being funny, so this is not, ‘Check out the whole new Conan,’ because there’s no such thing as the whole new Conan — until I’m medicated,” he said. Because of this approach, Conan has the youngest audience in late night (which is what sparked the change in format). O’Brien told a story about running into a gang of young kids while mountain biking in Los Angeles and being surprised that they were fans of his. “I wanted to ask, ‘Don’t you know how old I am? Look at this rotting pumpkin head!’” he joked. When O’Brien looks back at his early days on Late Night, he sees a younger but actually much stiffer person. In contrast to many of his contemporary late night hosts, O’Brien doesn’t feel pressure to do political comedy and will continue to stick to his strengths of silly, timeless bits, like Triumph the Insult Comic Dog’s trip to the Attack of the Clones premiere in 2002, a viral video predating YouTube. “In a weird way, I feel less pressure because it’s being handled […] by so many late-night hosts, and brilliantly,” he added. O’Brien is most looking forward to doing more international specials that, as seen in the Haiti and Cuba episodes, are a mix of funny fish-out-of-water moments as well as sincere, borderline diplomacy. In his Japan special, airing on November 28, he rents a Japanese family for the day and makes the “father” apologize to him for things his father yelled at him for in the ’70s, as when he spilled creamed corn on the linoleum floor in 1975. “He apologized to me very sincerely, and I felt like I had a breakthrough with my dad. It’s one of the weirdest things I’ve ever shot, and that’s just the tip of the iceberg,” O’Brien said.